“Yeah, I’m married to a dream with a mistress named music,” the gathered throng sang in unison, nearly 19,000-strong record-breaking rocking Bridgestone Arena like the hometown Nashville Predators did just a few days ago in the same venue as they clinched a spot in the Stanley Cup. Church told fans he promises attendees at every show the band will give everything they have. On Friday night, the visibly pumped singer-songwriter promised to take it further and made a simple request. Of course, none of this is new for Church or his fans. Nashville has been full of milestone moments over the years and this weekend’s two-night hometown stand at Nashville’s Bridgestone Arena marks the frenzied end of the cross-continent Holdin’ My Own Tour. Over 900,000 fans have made it the No. 1 most-attended music tour in the world in 2017 (Pollstar) with sell outs in of each of the more than 60 shows he’s played since January. Church has greeted each new crowd with a marathon set list and nearly four hours of music, playing more than three dozen fan favorites and deep cuts alike in a fully immersive experience that includes an intermission and no opening act. Friday night, while performing the title track of his fifth studio album, Mr. Misunderstood, Church brought out now-15-year-old McKinley “Mickey” Smay, who appears on the album’s cover, to jam. Church’s congregation responded in their usual overenthusiastic way, as captured by the Nashville Scene, which profiled “the country outsider” in a cover story to preview this weekend’s shows. Speaking of the Dead, Church and his longtime band covered “Tennessee Jed” Friday night before reprising Chief’s “Over When It’s Over” with Joanna Cotten on guest vocals, followed by an unexpected cover of Ben Harper’s “Steal My Kisses”—two unique cover jams just for Bridgestone’s crowd. In all, Church played 39 songs during his two sets with the to-the-rafters crowd standing the entire show, raising their glasses—and boots – when prompted. At one point, more than two hours into the show, Church stopped to gather album covers, platters of vinyl and magazines from fans before taking out a silver Sharpie and signing each, handing them back to fans as the crowd cheered. Church drew a new arena record 18,996 fans Friday night, breaking February’s 18,514 set by Bon Jovi. That record broke Church’s previous Bridgestone mark of 18,411 set Jan. 10, 2015. The singer has a chance to break his new record again Saturday night with another sold-out show, the 62nd and final of the tour. 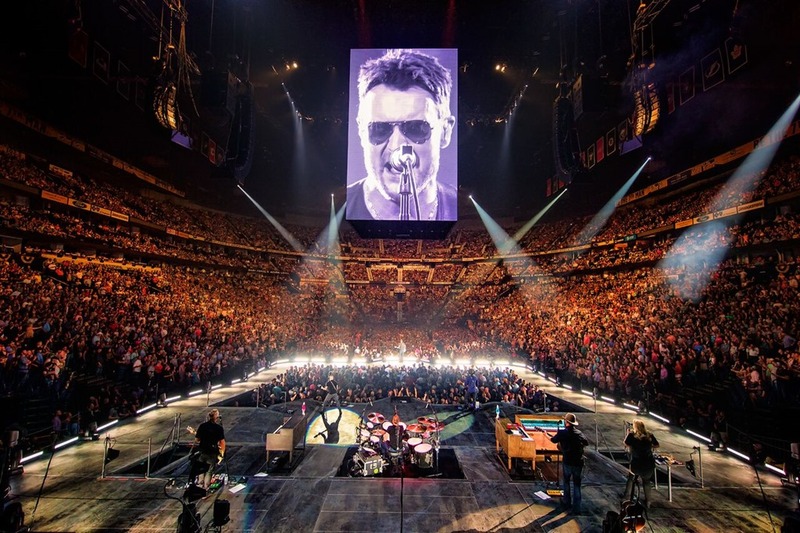 Church set the mark using a 360-degree stage and audience configuration and despite canceling 2,214 tickets for the shows previously listed on the secondary market. Church once again opened a pop-up store in East Nashville (address: 218 South 11th Street) for the third consecutive year with a portion of the proceeds benefiting his and his wife Katherine’s non-profit Chief Cares foundation that serves more than 2.5 million people around the globe with charitable giving. For more information on Chief Cares Fund, visit www.ericchurch.com/chiefcares. The pop-up store will be open through Sunday from 10 a.m. to 6 p.m. where it will feature rare items specific to the Holdin’ My Own Tour. The store will open again Thursday, June 8, through Sunday, June 11, during the same hours and will feature exclusive merchandise unavailable anywhere else, such as the debut a never-before-seen design of his These Boots by Lucchese cowboy boot line, a custom Orion Cooler and vintage tour T-shirts and posters. The boot design is called The Chattanooga Lucy after the “the most thrilling country dance tune to come along in ages” (Rolling Stone Country) from his fifth studio album, Mr. Misunderstood. Church’s devotees have one more chance at making it to the sold-out Holdin’ My Own finale. If they come in to the Nashville pop-up store Saturday and purchase the store’s exclusive poster, they have a chance of finding a pair of tickets to that night’s show.